This Satuday in Portland 10am-2pm! Giovanna Zivny, Elizabeth Nathan and others have organized Portland's Bakesale for Japan next Saturday, April 2nd from 10am-2pm at two of Portland's favorite coffee shops -- Ristretto Roasters (Williams) and Barista (Pearl). Home and professional bakers are grabbing their whisks and cranking up their ovens to raise money for Peace Winds Japan, a partner of Mercy Corps. This is a nationwide effort (Bakesale for Japan currently has generated 17+ bake sales stretching from San Francisco to NYC) that originated with Oakland chef Samin Nosrat. She raised $23K for Haiti last year with just three bake sale locations. Portland's Bakesale for Japan has a matching donation lined up from Intel. If you'd like to bake (amateurs and professionals welcome) or volunteer for Bakesale for Japan contact pdxbakesale@gmail.com. Here is the amazing list of Portland folks signed up so far to contribute tasty baked goods: Little T American Baker, Alder Pastry & Dessert, Woodlawn Coffee and Pastry, Fleur de Lis Bakery and Cafe, Alma Chocolate, Kir Jensen (The Sugar Cube), Kristen Murray (Paley’s Place), Kim Boyce (Golden Oven), Bakery Bar, Suzette, Random Order Coffeehouse & Bakery, Petunia’s Pies & Pastries, Confectionery, Little Branch Jam, and Bees & Beans. I've got the scoop! The Dovetail Bakery scoop! 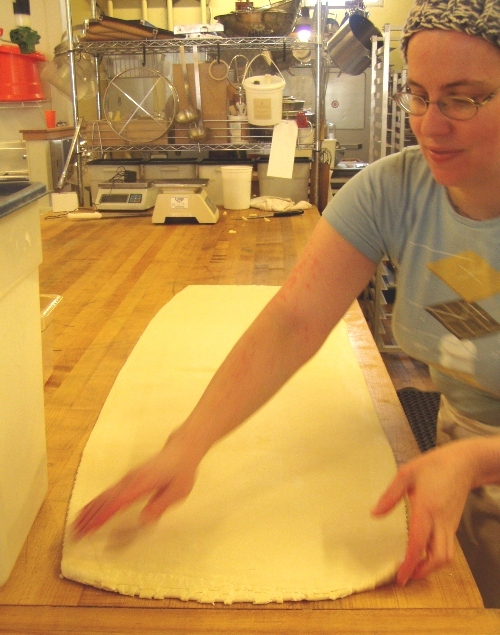 Dovetail Bakery owner Morgan Grundstein-Helvey has some fabulous news. 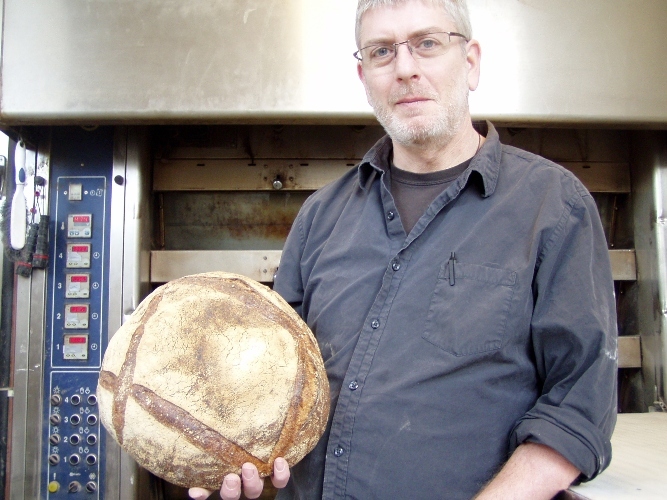 Dovetail Bakery about to spread its wings: New retail location! I'm in the final edits stage of my book at the moment and in an effort to stay on the sunny side about the seemingly endless tedium it's been great in the past few weeks to add some exciting new ventures to the pages of Food Lover's Guide to Portland. 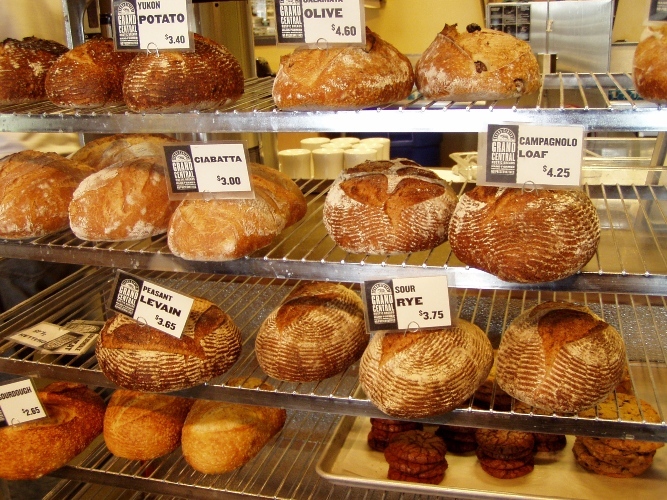 One that I'm very excited about is Dovetail Bakery's soon to open retail location on Northeast Alberta Street. For years Dovetail has vended at farmers market and delivered wholesale only, with no retail location. These lovely vegan baker ladies have been working around the clock the past few months to make the retail bakery happen and if all goes well Dovetail Bakery plans to ring in the new year and open shop on January 1st, 2010. The new Dovetail Bakery location has indoor and outdoor seating and plenty of bike parking in front. 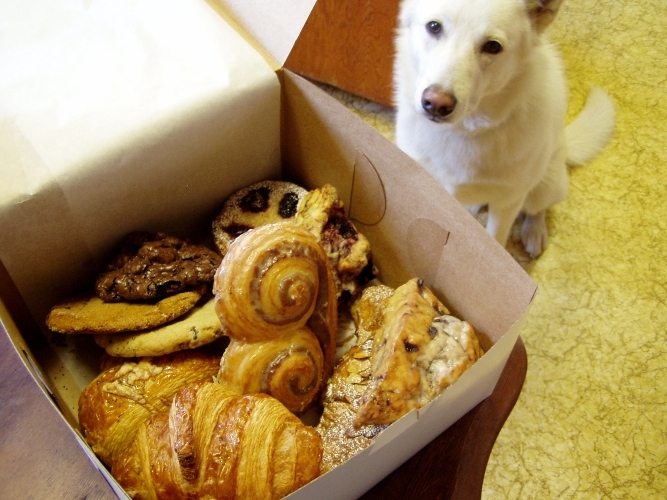 Same great vegan sweet and savory pastries at new retail location. Cinnamon rolls Aunt Miriam's sticky buns Seasonally inspired sweet buns Daily selection of cookies Seasonally inspired loaf cakes Seasonally inspired muffins Sweet & savory tarts Seasonal fruit pies Changing selection of cakes & cupcakes Artisan breads Housemade coconut yogurt w/ Dovetail Bakery granola & fruit Daily soup (featuring farm direct produce) French press Courier CoffeeMagic Kombucha Special orders are always welcome! *Everything baked fresh on site. *Loads of local ingredients. *New CSA/CSB program. Dovetail has partnered with local farm Wealth Underground Farm that will provide the CSA portion (veggies, fruits, beans, etc.) while Dovetail will provide the bread and pastries CBA portion. Contact Dovetail for more information. The fabulous Dovetail Bakery ladies move shop to Northeast Alberta. A week ago I got word of a galleryHOMELAND bake sale taking place this Saturday at The Cleaners at the Ace Hotel from 11am-2pm. galleryHOMELAND is a local non-profit arts organization and they've invited 30-plus chefs, mixologists, artists and others to donate baked goods and other tasty treats for the Saturday bake sale in order to drum up funds for their 2010 programming. Hot cider and old time country music tunes will be on the house and you can buy individual baked goods for $3-$5 and various jarred goods for $5-$8. galleryHOMELAND is a Portland, OR based non-proﬁt arts organization advancing awareness of Portland’s rich cultural community by creating new opportunities and lasting cultural exchange in a unique series of programs focused on exporting local arts and artists and importing national and international art and artists. The line of frozen pre-made and formed cookies (oatmeal chocolate chip, oatmeal raisin, peanut butter and ginger molasses) are even easier. You pull out the frozen dozen, separate a few cookies, roll them in sugar, put them on the cookie sheet and 10 minutes later you have delicious home baked cookies. If you have a chance this Saturday, June 6th GC is rolling out its new U-Bake line (pie dough, puff pastry dough, pre-made pies and cookies) at all of its Portland bakeries. 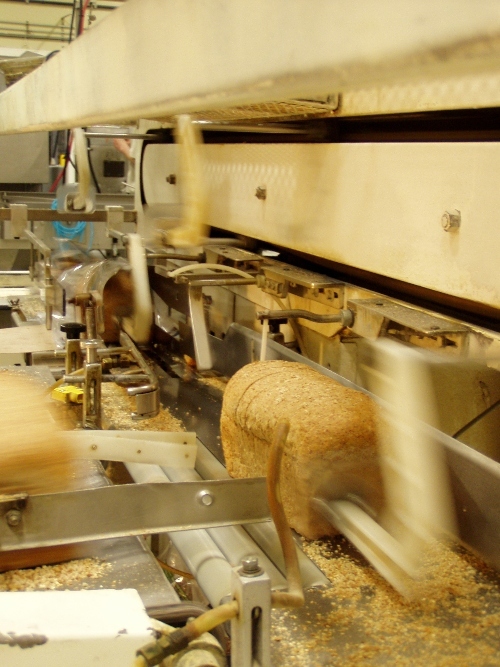 From 9am to 1pm each bakery cafe will be staffed with a baker sampling U-Bake products and sharing recipes and advice. Added bonus: 50% of the proceeds of U-Bake products sold that day will be donated to the Portland Schools Foundation. Be sweet and go buy some sweets. Portland isn't so big and once you've anchored yourself in the food community it's hard to buy a loaf of bread without some sort of connection -- oh they're using thatlocal co-op's flour or that's the amazing bread that I used to always wait in line for at the farmers market... Well, the web of connections has been growing to Charlotte's Web proportions lately as I research and write my book which is why I feel ok lumping such a diverse group of people and businesses together in this post. Last week I got to meet one of Piper's back-in-the-day employees -- Julie Richardson, now owner of Hillsdale's Baker & Spice Bakery. Julie and Piper are close friends and in many ways they've mirrored each other the past couple years, mostly in terms of writerly pursuits. More on that later, but let's just say that there are a lot of buns in the oven in terms of Portland food books by Portland food folks soon to be published. 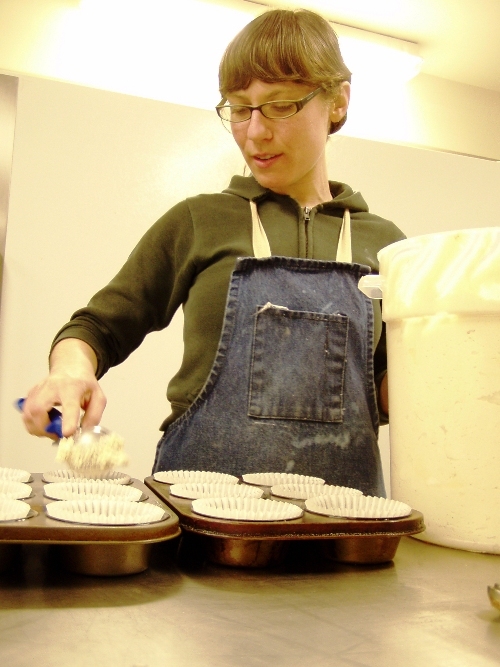 Julie told me about how she started her first bakery in Ketchum, Idaho at the wee age of 23. 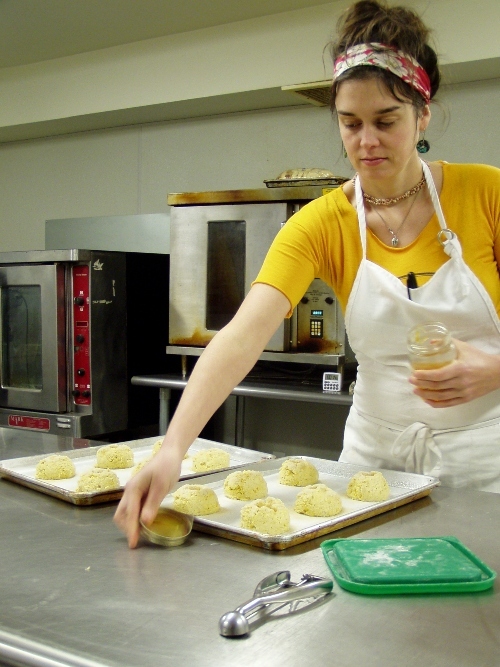 After moving to Portland in the late 90s she managed to build up a successful farmers market bakery business. She opened the brick and mortar Baker & Spice Bakery four years ago. 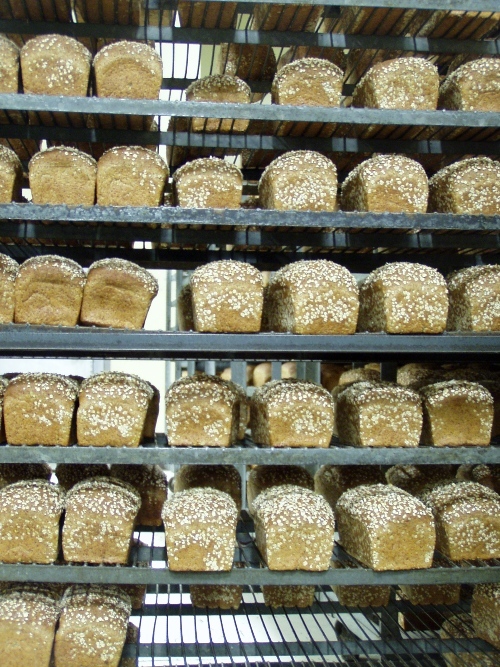 Baker and Spice's bread is baked by Richardson's husband Matt Kappler. I also recently visited with David Briggs of Xocolatl de David. He's been crafting chocolates for more than three years in Portland and his current commercial kitchen is in the back of his friend's hopping Southeast Portland sandwich shop Meat Cheese Bread. When I visited with David there I got to try his caramelized cacao bean honey brittle, all of the base chocolates, one of his tasty fleur de sel chocolate caramels and a soon to hit the shelf chocolate bar. I met with David in the morning and with one of his friends -- Steve Jones of Steve's Cheese -- in the afternoon. David and Steve worked together at Park Kitchen for six months while David was sous chef and Steve was a server. Now David makes regular deliveries of his chocolates to Steve's shop. 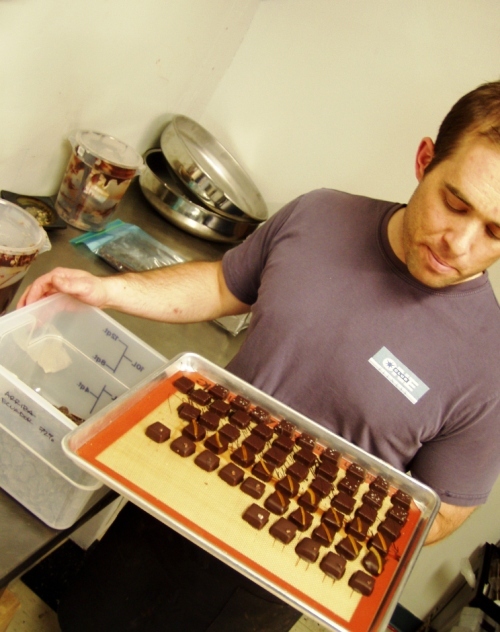 David Briggs has been making his chocolates full time since leaving Park Kitchen a little more than a month ago. That afternoon Steve and I sat in the back room of Steve's Cheese and tried some tasty Zingerman's poundcake samples while talking cheese. 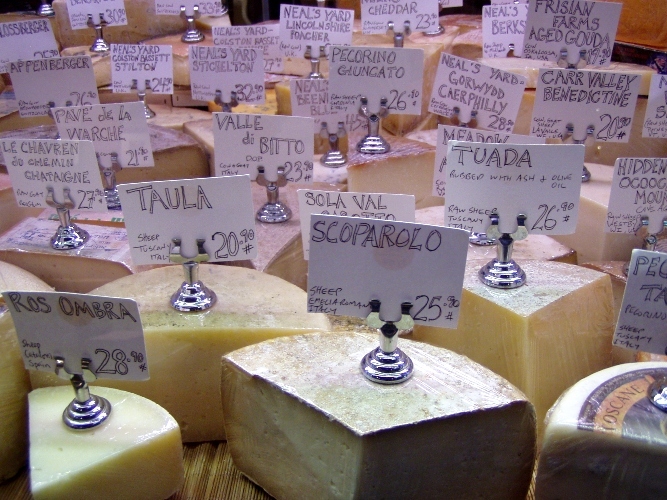 In addition to nearly 200 cheeses in the case at any given time Steve's Cheese also stocks cured meats and all sorts of non-perishable treats such as arbequina olive oil, harissa, sardines and pickled peppers. 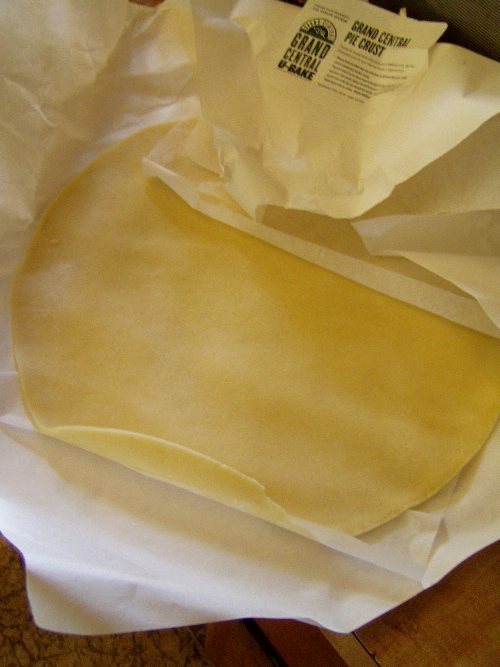 Oh and he'll let you borrow his Raclette machine as long as you buy at least a quarter wheel of the semi-firm, nicely meltable cheese. Anyway the friendship of two premier Portland female bakers and a local cheese vendor and chocolatier has proved yet again that everything (in Portland) is connected, which makes my work all the more enjoyable.